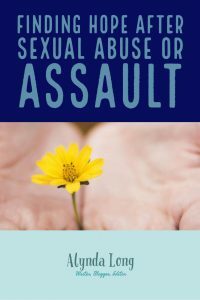 Let’s talk about sexual abuse and sexual assault. I know. It’s uncomfortable, not for polite conversations. Yet, our society is in turmoil with the issues around Brett Kavanaugh’s confirmation to the Supreme Court. With Dr. Christine Blasey Ford’s story and testimony in front of the United States Senate, opinions on the topic are on Google, the news, Facebook, Twitter, and every other possible place we can express our feelings in American–and global–society. It’s THE news right now. All I see is Kavanaugh. Ford. Assault. Accusations. I’m sure you see it everywhere too. Let me make it immensely clear I am not interested in debating politics or THAT particular story. To me there’s a far more personal matter to discuss. I’m drawn to the millions of women who are testing their voices, choosing to share their own stories of abuse or assault. That’s where I stood (okay, I really crawled…and sometimes I curled into a ball) just a few years ago. I knew sexual abuse and assault were part of MY story, but I didn’t want YOU to know it. But, God. I didn’t want to be judged or have my personal guilt and shame shared with others. I didn’t have HEALING from the experiences of my life. I didn’t even know that was possible. But God. Maybe you’re secretly Googling sexual abuse or assault statistics. Maybe you haven’t told a soul about that night forty years ago. Maybe you are angry with God. So many maybes abound here, my friends. So many maybes, but I want you to know you are NOT ALONE! And more importantly than knowing you aren’t alone is the fact that it was NOT YOUR FAULT! I know the weight of the anger, the guilt, the shame. That weight is heavy. That weight can be unbearable at times. It can lead to bad choices. It can lead to addictions self harm, and worse. Over the coming weeks and months, I am going to share ways the Lord has worked in MY life and MY heart to give me the healing He has for YOU TOO! I want His healing for every single woman who questions her value due to sexual abuse or sexual assault she’s endured. Whether those happened yesterday or fifty years ago, they still have weight. They still need to be healed by the great Healer. My deepest passion is for you or your sister or your friend or your mother or daughter or or or or…to find HEALING! It’s there. I promise! Is the path easy? NO, ma’am! It’s one of the hardest things I ever did, but it was worth every fear, tear, and struggle to get to a place of freedom. That’s what healing really is all about, my sisters. 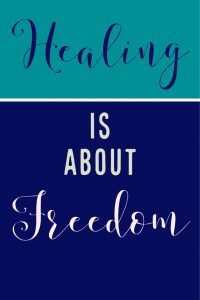 Healing is about freedom! FREEDOM! Who doesn’t want freedom? For now, I’m including a link to my testimony I shared on A Time to Dream Radio. I pray it blesses you and gives you hope too. It is NOT for little ears. I want to make sure you know to listen when not around kiddos. Nobody protected my little ears and I feel strongly (as you likely do too) about their protection. If you’d like to know more of my story of healing from sexual abuse, but can’t listen to the interview. I am including a post I wrote for the website Faith Beyond Fear. If you feel safe and comfortable, feel free to leave a comment below. If that is too public for you, PLEASE feel free to reach out to me on Facebook or via email. All you need to do is say, “Me Too” in the topic. I want to pray with and for you, my friends. If you want to love someone who has sexual abuse or sexual assault as part of her story, but have NO IDEA how to do it, let me know that too. Two and a half years ago, I faltered under the weight of anxiety and depression and couldn’t imagine a life where moving beyond fear was possible. My marriage teetered on the edge. Night terrors and flashbacks due to childhood trauma and sexual abuse plagued my nights and crept into my days. I mothered my children out of unseen fears. At the end of myself, I contemplated removing myself from this world. I was falling apart in every area of my life. The dam had broken, and I felt doomed. Fear consumed my life. He knew my burdens were heavy, impossible for me to carry alone. With that slightest hope, I signed myself into a Christ-based psychiatric facility. I leaned into the God of the universe because there was nowhere else I could rest. Fear ruled my life for over forty years. I believed in the goodness of God and the sacrifice of Christ, but my pains were too much even for Him, or so I thought. It’s easy to look back and realize how simple it was to reach out to Christ, but simplicity does not equal easiness. 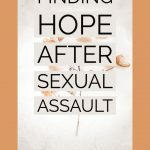 In desperation, I took a step of faith and joined a Christ-centered recovery program for women seeking healing from sexual abuse and assault. Terrified, but exhausted from living in fear, I pushed into the unknown arena of faith. Joining the group wasn’t enough to heal the brokenness inside of me, so I trusted the Lord to provide the strength it took to share with these women who eventually became like sisters. I shared my memories and hurts then examined the impact they’d had on my life and each of my relationships. The damage was extensive. The enemy had grasped onto my hidden shame and guilt and whispered so many lies into my ears I didn’t know how to trust, how to believe. In my brokenness, he told me there was no way out for me except suicide. With God’s strength and His word, I combated the enemy’s lies. I was not responsible for my abuse. I was not unlovable because of what others had done to me. Even the ways I’d acted out in the wake of my abuse did not exempt me from the hope I had in Christ. I was not too far gone. We serve a God who pursues us relentlessly. He tracks us down in those dark places and offers us hope. We serve a God whose “power is made perfect in weakness” (2 Corinthians 12:9 ESV). The clarity in which the Holy Spirit reached into my darkness and showed me the love of the Father transformed my life and the lives of those closest to me. Like Paul, the scales fell from my eyes and Christ’s truth stood before me. He wanted to restore those years. He wanted to exchange my ashes for beauty. It didn’t happen overnight or without work on my part. 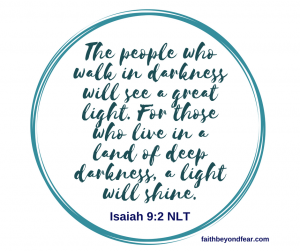 Choosing Christ’s light over the darkness that plagued me for decades was not painless. Reaching beyond my fear into the faith I was developing terrified me, but choosing faith sparked a hope and joy deep within me I’d never felt or known. I chose to push beyond and work through my abuse biblically with other women of God who had walked their own paths of darkness. Offering forgiveness to those who had wronged me because my Father asked me to do so gave me indescribable peace. Examining my brokenness through the lens of scripture filled my heart and mind with God’s word. My friends, God gives us the choice. He allows us to decide whether we follow His narrow path or the wide road. The beauty is in the choosing. The beauty is in the trusting. His beauty is waiting for you too. Your story may be like mine, but it may be completely different. He still wants peace for you! Will you join me in the space beyond fear? The God of the universe will reach into those dark areas of your life and imbue them with His supernatural light. He wants good for all of us. He wants all of us to move beyond fear. Trust in the God of hope. If you need to report a sexual assault, please call this number: 1-800-656-4673. It’s the national hotline for sexual assault and someone should be there 24/7. Alynda, I applaud you for your courage, and I pray your testimony, insights, and reliance upon God will help scores of ladies to find freedom through Christ. Thank you! Thank you so much, sweet friend. I don’t feel brave, but I desperately want to be obedient and see the light overcome the darkness.